Need To Fill A Position Fast? Need To Upgrade Your Staff? Be proactive! Catch some of the talented worker/job seekers when they come on the market for YOUR organization. Sign up with ACT today. 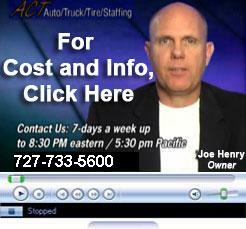 How Do We Get So Many Auto/Truck/Tire Job Seekers? Ads Run in 165+ Newspapers Across The U.S.
Bryan Stasch - Automotive Training Institute in Baltimore, MD - "Joe, I have to tell you, ACT is everything you told me it was. I have heard nothing but good things from the clients who have been working with you. I also know from personal experience, I received 20-30 resumes for the ad that you posted for me and hired a great candidate." Karen Bryson, National Recruiting Manager - Pep Boys - "Our Recruiters are extremely pleased with the quality of candidates received through ACT. We are in the midst of an aggressive flat-rate hiring program across the country and ACT was listed as one of the top keys to our hiring success to date." Joe Iannelli - New Jersey AAA Approved Auto Repair Department - "We heard from one of our New Jersey AAA Approved Shops about this program. We checked them (ACT) out thoroughly, and now we recommend their program to all of our New Jersey AAA Approved Repair Shops." Copyright © 2015 ACT Systems Inc. All rights reserved.